Happy Summer everyone. I wasn't paying attention and lo and behold it came the same as it does every year. And I for one am really glad. This week was a real mixed bag with some great blessings and celebration to help offset the harder stuff. And that's what FFF is all about...being able to find some good things even on the harder weeks when life seems to be coming at ya from every angle. And just as a follow up, the comment moderation seems to be working so far. I just have to figure out if I can email a reply if you are not in my email contacts so hopefully I will know that soon. I just have to remember to actually publish the comment and not just delete it in my email after I read it. So let's get to the fave five. 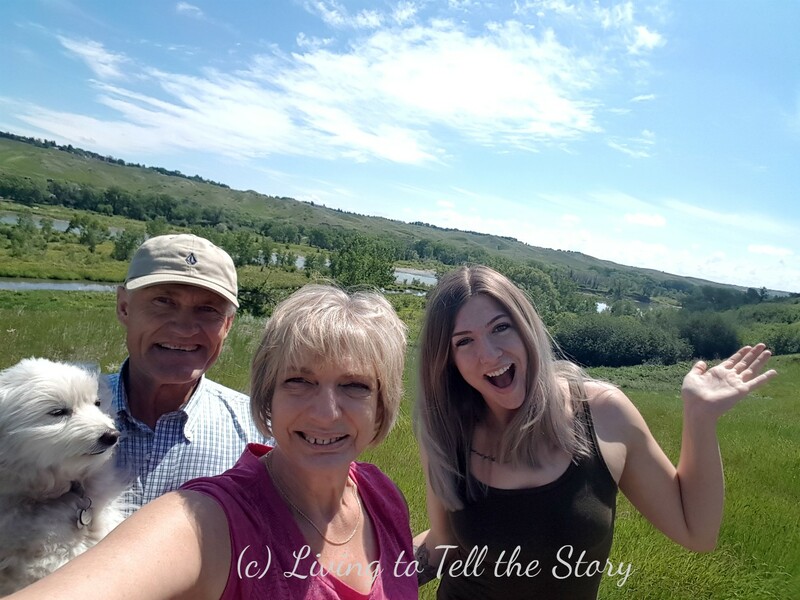 ~celebrating Father's Day~ This year was kept real simple as my Dad was in the hospital. And only one of my adult children was able to be here. My hubby and wonderful father to our 3 great kids chose a family walk on one of his favorite trails, then he chose a Chinese food buffet at a new restaurant he's been wanting to try. Then we came home and relaxed a bit. The other two kids called later in the day and chatted with their Dad which he really loved. When he had his Father's Day snooze I went up and saw my Dad with a card and a good cup of coffee as I knew he wasn't enjoying the hospital stuff too much and he's like me...we like our coffee. It wasn't a huge or boisterous day like we've had in the past but it was a good one and we celebrated the two men who deserved to be celebrated. 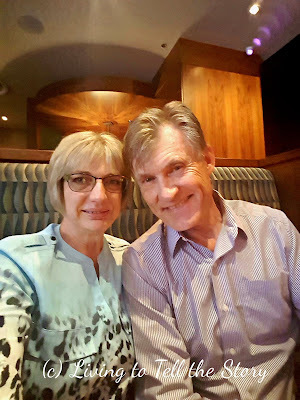 ~ celebrating 35 years of marriage ~ Monday my Hubby and I celebrated 35 years of marriage. Wow I can't believe I typed that. 35 years of special moments, companionship, memories, laughter and tears, giving and forgiving and being there for each other. Love my guy and always will. Again we didn't do a whole lot. It was a work day so we just had a lovely steak dinner out and enjoyed being with each other. ~celebrating milestone anniversary~ we also celebrated Hubby's sister and brother in law's 50th Anniversary! What a milestone! Their daughter threw them a lovely open house and many people came and congratulated and wished them many more. It was nice to be included into their special moment. ~ simple home made salad dressing ~ made with equal amountsTuscan flavored olive oil and Lemon Balsamic vinegar with salt and pepper to taste. So good on tossed salads and marinated salads or even just cut cherry tomatoes. So simple, healthy and delicious. ~ fun tv series~ While scrolling thru the channels the other day I found a show that caught my interest and found out it was a 6 week series. It's called "Back in Time for Dinner". It's a Canadian show on CBC and the premise is they've taken a modern family of 5 and each week they take them back in time through each decade starting with the 1940's. They live the way families did in that decade, wear the clothes, eat the food of the decade, take on the roles. It is very interesting not just to find out what they ate at that time, but why and what was going on in society and how women's, men's and children's roles in the family were at that time in Canada. It's also very interesting watching the kids (and adults) cope without all the technology that so takes our time nowadays and all the fancy appliances we have now. It has really opened my eyes and I must say just seeing 2 episodes I really feel like I understand my mom in law a whole lot better. Even though she is now passed away I totally have a new appreciation for her. My mom and dad did not move to Canada until 1956 so I'm sure I will relate and learn from the next episode which will be the 1960's. ~new cookie find~ I don't usually ever buy pre-packaged cookies. I find them way too sweet and let's face it, they are full of not so good things. 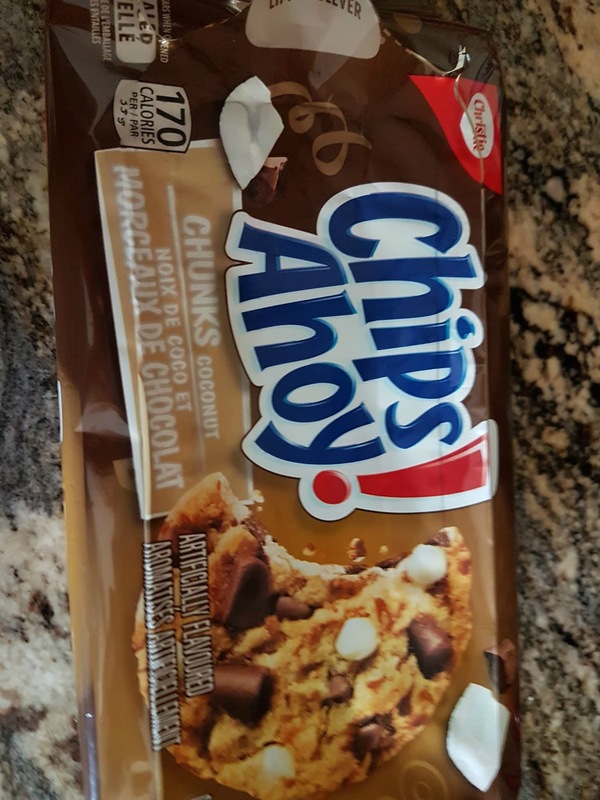 But when I saw the Chips Ahoy Chunks Coconut and they were on for a good price I caved and bought one. Oh my they were so good. Dunked in coffee even better. 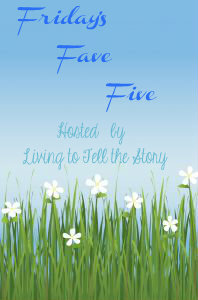 What were your favorite five blessings of the week? Congratulations on your anniversary. We also had our anniversary this month - 34 years. And sometimes a quiet celebration on your own is just what you need. Enjoy the weekend. Happy anniversary! Ours is usually pretty quiet, too - partly because it's in December when there is so much else going on. Just a nice dinner out and cards, sometimes flowers. Just some time alone together in a crazy hectic schedule is special. I'm sorry your dad is in the hospital. I hope he's getting better. That TV series sounds both fun and interesting. Happy Father's Day to your hubby. And Happy Anniversary to the two of you! I do hope and pray that your dad is out of the hospital now and feeling much better. AND enjoying his coffee! 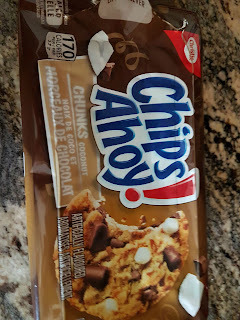 I'm not a big store bought cookie fan either but I do love coconut so maybe I should give these a try. Happy anniversary. Happy Anniversary!! ours is in one week! I LOVE that pic of your Father's Day outing. What a great photo! Yay for those cookies...i just might need to look for those tomorrow and bring them on vacation! i never buy store cookies either but those are right up my taste bud alley! great list of FFF this week! enjoy the weekend....is an overcast and cool one here. Sounds like a perfect Father's Day. And happy anniversary to you two! Thanks for sharing the salad dressing recipe. Nice and simple, and the lemon sounds delicious. That show sounds really neat. I wish we could get it here. Happy Anniversary to you two! Congrats! That tv series sounds like fun. I wonder if I can come up with it down here. Hope the beginning of summer treats you all well. Congratulation to your wedding day ! Next year we will celebrate our 50th !! Long time with the same man, lol ! We never celebrated Father's day, just wasn't the use.